Maternity clothes? Yea. I can get away with dresses too, which is actually my preference since anything tight on my belly is uncomfortable! In this picture, I’m actually wearing a nightgown from Target (similar HERE)! No one would know it’s a nightgown unless they actually owned it as well. I got two of them and they are now a prego staple for me! Best moment this week: Going to my midwife and talking about my delivery. It feels so close when I’m there talking about it! Miss Anything? loving coffee, having energy, fitting into my regular clothes, rinse repeat. How are you sleeping? Sleeping great still! Baby Girl is actually moving more during the day and less at night so that’s helping. Movement: She moves constantly. I went to my midwife yesterday and Baby Girl is head down! So I feel her in the same spots everyday. Food cravings: I actually have been wanting cinnamon sugar pop tarts for the past few weeks, but I didn’t let myself give in. Finally, last week, as I strolled down the cereal aisle at Publix, there they were in all their glory. So I bought a small box and they were oh-so-delicious! Anything making you queasy or sick: I’m feeling pretty good this week! I only get queasy right around Diclegis time or if my stomach gets too empty. Belly Button in or out? working its way out! What are you excited for? So much! This weekend, we’ll finish the trim in the nursery. In a week and a half, Stew and I go to Asheville for our last hoorah, and the next weekend I’m having a little baby shower with some girlfriends. Then it’s Baby Month! Maternity clothes? Definitely. My friend Sara gave me two shirts from Gap Maternity. I’m wearing one in this picture. They fit perfectly. I’m also rocking the skinny jeans from ASOS that I got when I was pregnant with Turner. Best moment this week: Getting trim for the nursery! Stew’s putting it up as we speak. Her room is coming along! Miss Anything? loving coffee, having energy, fitting into my regular clothes, and cooler weather! How are you sleeping? This week has been great! I listen to my hypnobabies right before I fall asleep every night and sleep like a rock. Movement: She moves a ton. It’s pretty predictable at this point too. Food cravings: The queasiness makes food not that exciting. I eat lots of fruit and I try to get as much protein I can. Anything making you queasy or sick: Each day is different. But I still have queasy days here and there, but I’m so used to it. What are you excited for? Stew and I are going to have a little getaway to Asheville in a few weeks once work slows down. That will be awesome. When we get back from that trip, it will be Go Month! Can’t waaaaaait! How far along? 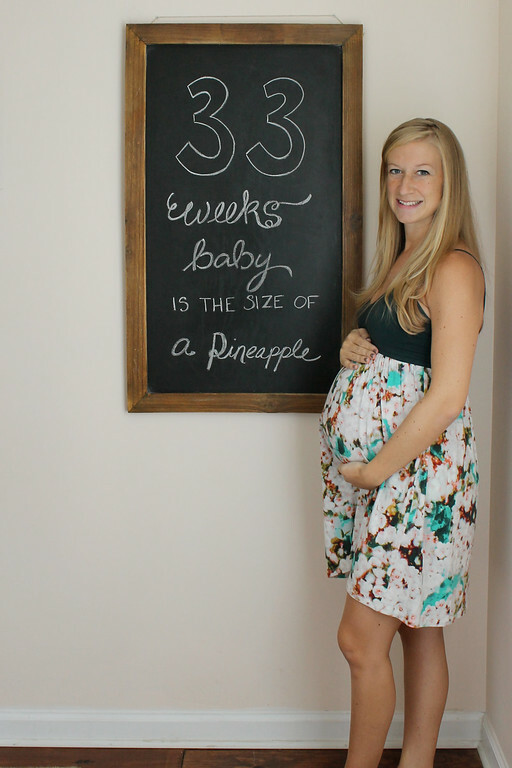 30 Weeks. Can’t believe it’s almost here! Total weight gain/loss: about 27 pounds gained. Maternity clothes? Yea. 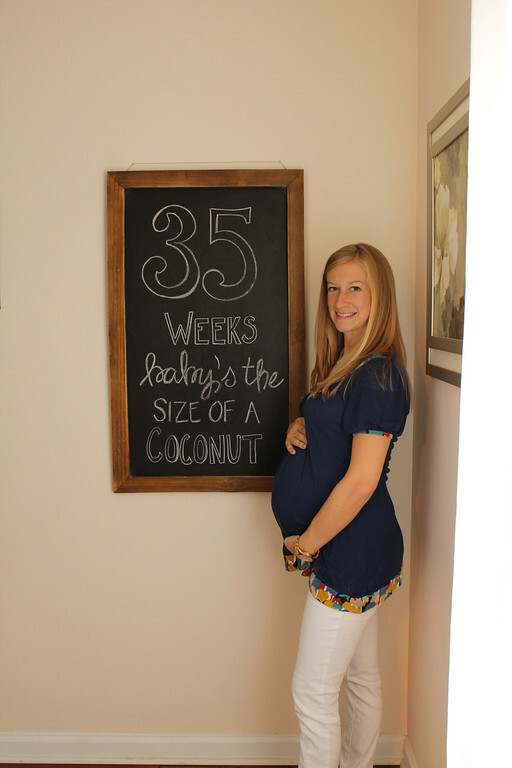 I also got some larger tops at Old Navy (like the one in this pic) because they fit over the bump perfectly! Best moment this week: I went to see my midwife for my 30 week check up. My iron is up so it’s safe for me to deliver at the birth center. Yay! They’re pretty sure Baby Girl is head down, but they’ll check for sure in a few weeks. AND I made all of my appointments from now until D-Day. I just love going there and talking about the whole process and delivery. Miss Anything? Waking up and drinking a giant hot mug of coffee, having an appetite, and fitting into my favorite clothes. I’m also getting geared up for Fall and all of my favorite pumpkin spice things. I know it’s a while off, but I get antsy towards the end of July. How are you sleeping? For the most part I’m sleeping well. I still wake up once a night to go to the bathroom. Last night I slept like a rock. But the other night I had anxiety (nothing in particular, just a hard time relaxing) and was being kicked hard, so I didn’t fall asleep until about 1. Then Turner woke up at 5:50, so I was exhausted to say the least. Movement: This girl…. She’s a mover for sure. Food cravings: Still loving fruit, cereal, and cheddar cheese. I just picked up a box of pumpkin spice waffles to satisfy my fall fetish. Anything making you queasy or sick: I learned the hard way that I am still nauseous if I stop Diclegis. I skipped a day by accident and it took about 3 days to even back out and feel decent again. I could totally be the spokes person for the stuff…move over Kim Kardashian. Belly Button in or out? The outer edges are starting to unfold. It looks out through my clothes but it’s hanging on by a thread. What are you excited for? Having Baby Girl and seeing how this story unfolds! I told my midwife that I think she’s a ten pounder. Can’t wait to see if that’s true. I go back and look at Turner’s birth story and our old pictures, and I’m so excited to do it again. Turner really seems to be coming around to the idea too! 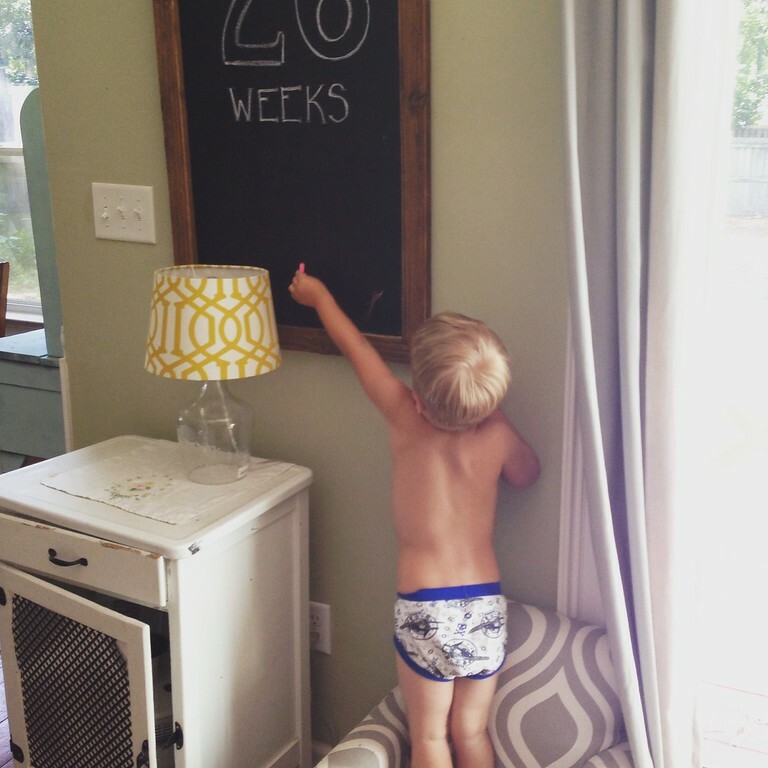 I think he’ll be an amazing big brother. Total weight gain/loss: about 26 pounds gained. Maternity clothes? Definitely. 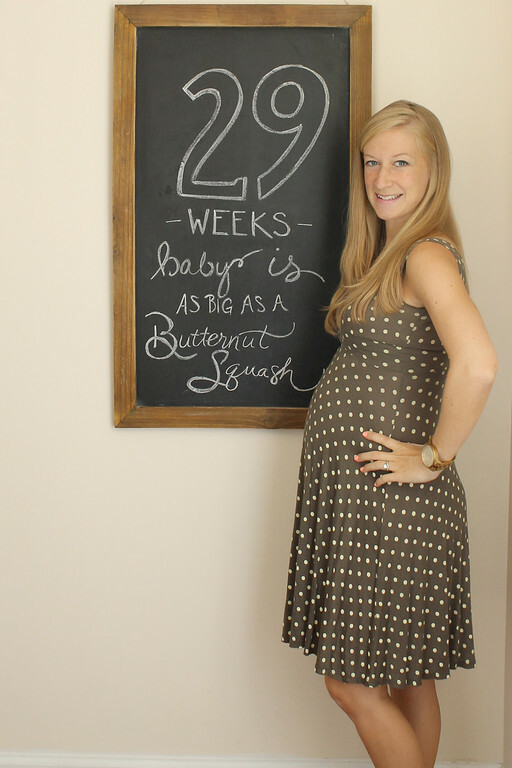 The dress in this picture isn’t maternity, but it’s loose enough that it fits! I also got some soffee shorts to hang around in at home. Best moment this week: We started our hypnobabies scripts last night. I was actually feeling anxious yesterday about the reality of this baby coming, and the hypnobabies completely relaxed me last night. It boosted my confidence that I CAN do this! Miss Anything? Energy, fitting into anything I try on, and COFFEE! How are you sleeping? Sleeping great. Movement: She moves non-stop. I like to see her roll around and watch my whole stomach shift. It’s pretty cool. Food cravings: Still loving fruit, cereal, and cheddar cheese. Anything making you queasy or sick: I actually got really queasy the other night, to the point where I needed to have a bowl close by in case I got sick. I’m still on my diclegis. Labor Signs: Braxton Hicks, but nothing real yet! Belly Button in or out? In, barely. What are you excited for? 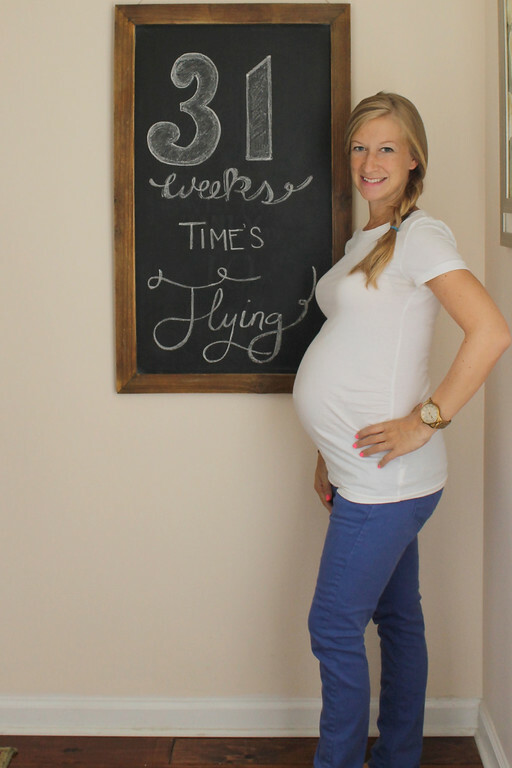 Everything…the birth process, my maternity photo shoot, and baby girl’s arrival! Total weight gain/loss: about 25 pounds gained. Maternity clothes? Oh yea. I’m wearing maternity skinny jeans and a maternity top from A Pea in the Pod in this photo. I still mix it up with dresses, some drawstring shorts and longer tops that I have. Best moment this week: Lots of great moments. We are making progress with the nursery. We picked up some frames from Michaels and hung up the wall art. It’s starting to feel real! Miss Anything? Having energy, loving coffee, waking up in the morning and not feeling hungover. How are you sleeping? Still good for the most part. Last night I was wide awake and my insides were being used as a punching bag, so it took me a little while to fall asleep. But otherwise, pretty great! Movement: Oh yea! I feel more distinct movements now. I have to start my “kick counting” this week. 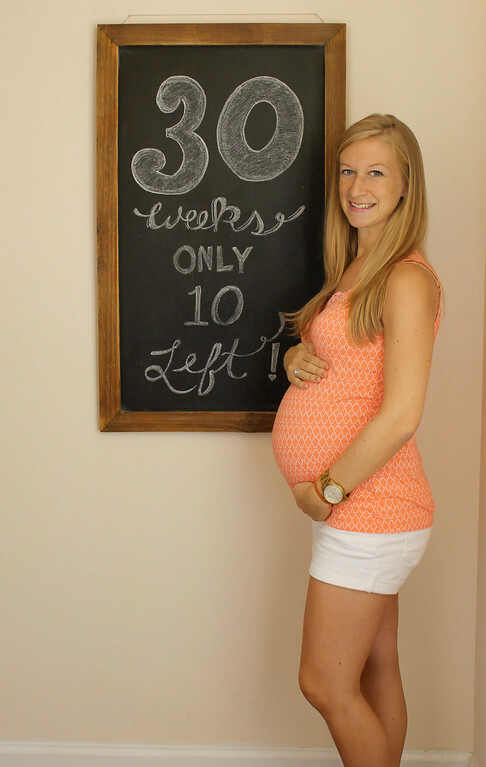 She needs to kick 10 times within an hour….let’s just say she kicked 10 times in 2 minutes. I think we’re good! Food cravings: nectarines, raspberries, spicy foods, cereal. Anything making you queasy or sick: Still just getting through the day to day. Some days are better than others. I re-upped on my Diclegis at the birth center today. As long as I’m on that, I feel ok.
Labor Signs: Just Braxton Hicks. They’re not painful just awkward feeling. It feels like she’s pressing on my bladder, which is what I thought it was for the longest time. It gets really tight and hard to walk for that moment and then it goes away. Wedding rings on or off? On. I take them off when I sleep, but I’ve done that since I had Turner. What are you excited for? Getting glucose test results. Fingers crossed! I’m also excited to do our maternity photo shoot in a few weeks! Total weight gain/loss: 23 pounds gained. Maternity clothes? Yes. Bottoms are more important than tops. I can get away with some of my tops if they’re long enough. Best moment this week: There have been a lot of good moments. But probably the best was when I laid with Turner before bed and he asked me to sing Jesus Wuv Me. We’ve been singing it for a few weeks now, but he started singing along and it was SO cute! There’s nothing sweeter than hearing your baby sing about Jesus. Miss Anything? Getting dressed and knowing that anything I put on will fit. I also miss wearing my favorite jean shorts. How are you sleeping? Solid. Baby girl kicks constantly, but I’m sleeping through it for the most part. Movement: Constantly! If this is any indication of what she’ll be like when she’s born…I’m nervous. Food cravings: pretzels, lemon, berries, deviled eggs. Anything making you queasy or sick: I still have rough days. Food doesn’t really play into it though. 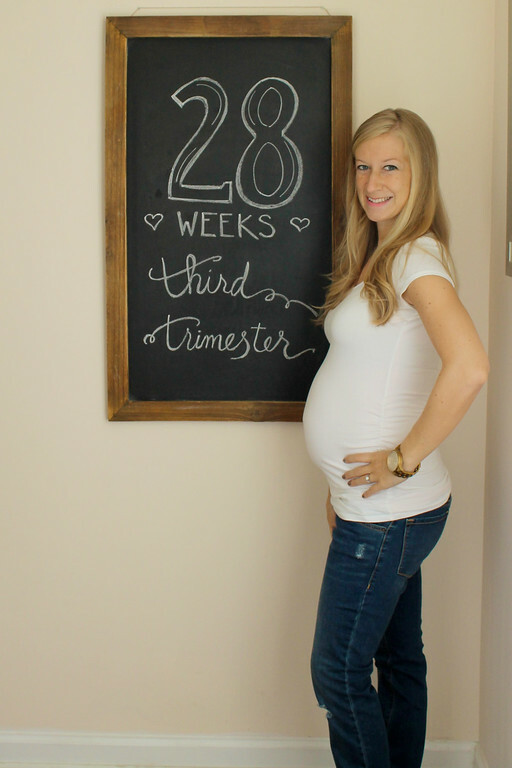 Labor Signs: I noticed a little bit of Braxton Hicks starting. But it’s sporadic. Nothing major yet, thank goodness! Belly Button in or out? In, but not for long! What are you excited for? Celebrating 4th of July, going to the doctor next week. Total weight gain/loss: 21 pounds gained. Maternity clothes? Yes. Although, in this picture, I’m wearing regular ol’ drawstring shorts from Target. They were a purchase from when I was pregnant with Turner. Best moment this week: Stew and I came to the decision, after lots of talking and praying, that he would just work with me in our rental business. It will definitely be a blessing for our family. Not only will it help me a ton, but he’ll be around so much more for Turner and Baby Girl! Miss Anything? Waking up in the morning and not feeling like I got hit by a train. I literally hit my snooze for an hour until I roll out of bed with one eye open and pound a large iced coffee so I can function like a semi-human. How are you sleeping? Great! I have a feeling sleeping won’t be a problem until I’m so huge that I can’t get in a comfortable position. Movement: She’s moving a bunch, especially at night. I think her feet are on my left because, when I lay down on my left side, she kicks so hard into the mattress forcing me to roll over. Food cravings: I love anything juicy like peaches, watermelon, and raspberries. I also love lemon. And I’m loving spicy food! Anything making you queasy or sick: Still the occasional queasy spells. For the most part, I’m getting better though! What are you excited for? Celebrating 4th of July! I love this holiday because it’s so festive and celebrates our amazing country! 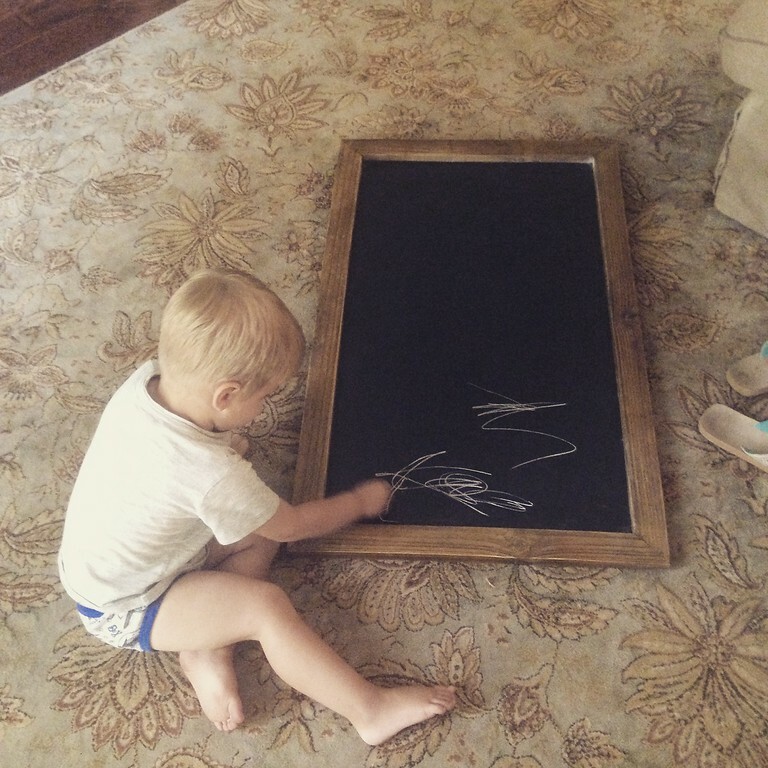 And for some Turner love….he is becoming quite the chalkboard artist! TGIF!